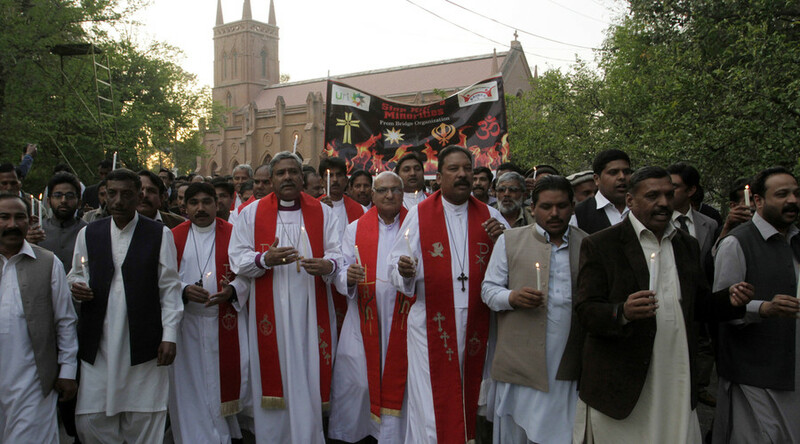 At least 42 Christians accused of murder in Pakistan were reportedly told they’d be acquitted if they embraced Islam. The accused face the charges after the lynching of two men following twin suicide blasts at churches during Sunday mass. Prosecutor Syed Anees Shah initially denied telling the accused he could guarantee their acquittal if they converted. However, he later admitted he did, when told by Pakistan’s Express Tribune that the accused had a video recording of what he said. “He asks them if they embrace Islam, he can guarantee them their acquittal in this case,” rights activist Jospeh Franci, who is involved in the legal proceedings, told the Tribune. Franci claims all of the accused remained silent following the offer, except one who appeared to say he would rather be hanged than embrace Islam. The trial of the accused is taking place in an anti-terrorism court in Youhanabad, Lahore following the lynching of two men on March 15, 2015. The men were suspected of being involved in the planning of two suicide blasts at churches in Youhanabad on the same day, which left at least 14 people dead. Counsel for the accused, Naseeb Anjum Advocate, told the Tribune that the prosecution’s offer was not new, saying it was offered around six months ago. “The government should get rid of such elements that bring [a] bad name to the state by such acts,” he said, claiming the prosecution was “blackmailing” the accused. Islam is the state religion of Pakistan, with Christians the second largest minority, accounting for about 1.6 percent of the population.